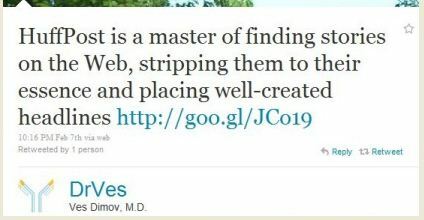 The tweet shown here, by Dr. Ves Dimov (@DrVes), is interesting on different levels. The tweet is about Huffington Post, but it gives good advice on how to write a blog article in general — Find a juicy nugget in a news or blog article that’s unnoticed by most readers and feature it in your own article, quoting it prominently and adding your own spin to it. But beyond its application to writing blog articles, Dimov’s tweet applies at least as much to writing tweets. Even more than a blog article, a tweet needs to strip a subject to its essence, and put it into a 140 character message that combines the arts of narrative writing and headline writing. Huffington Post is a master of finding stories across the Web, stripping them to their essence and placing well-created headlines on them that rise to the top of search engine results, guaranteeing a strong audience. A great example of combining the simple elegance of Twitter and the power of human judgment to search out an interesting nugget in a long page of text, and bring it to the attention of the Web’s eyes. With Google’s spam troubles recently, there’s been much discussion of the renewed importance of human curation, with Twitter being seen as a prime vehicle, and I think this is a nice example of that. Posted in Curation, PicsYes, Twitter, Twitter Tips, Uncategorized. Sarah Houghton-Jan reports in an article a few days ago that a new PEW report shows the growing tendency of people to get news from the Web. She suggests that librarians should jump on this, and offer our skills in filtering, teaching finding-skills, and creating tutorials. I like Sarah’s idea, and take it a step further — As Sarah mentions, one of the findings of the PEW report is that mobile devices are providing a growing portion of online news, so I suggest that an area of news curation that especially needs librarians’ skills is mobile news — I’ve been watching for news sources that have mobile apps or mobile-friendly sites, and I find that they vary a lot in coverage and quality — They’re in great need of the curatorial skills of librarians! 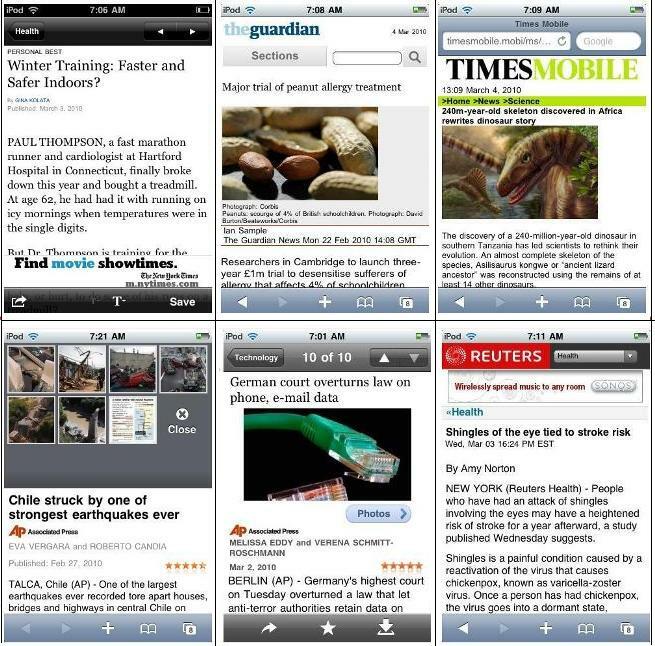 Sites that I like (with screenshots below) are: New York Times, AP-News, The Guardian, The (London) Times, and Reuters. I especially look for good pictures. The best of the sites listed here for pictures is AP-News — Note that the bottom left screenshot below is a report of the recent earthquake in Chile, with an AP-News gallery. For news-related pictures, I’ve found that the best sites are not traditional news sites, like the ones listed here, but other, blog-like sites — As I discussed in an earlier article on Haiti earthquake coverage, great pictures for that (and for the Chile earthquake as well as other news subjects) are at The Big Picture/Boston.com and the Hyderabad News WordPress site. Posted in Curation, iPhone/iPod Touch, Libraries, Mobile, Newspapers, PicsYes, Uncategorized. Curation is Hot! – the BIG CURATOR is Doing It! Curation seems to be a trending topic, so I’m doing research for an article or two on it. Little did I suspect that the popularity of the subject had reached the heights shown in the story below, that I discovered serendipitously in a Google search (scroll down to see it documented). Shaquille O’Neal’s first art show is, in fact, opening Feb 19 in New York, with 66 works selected by Shaq, including Ron Mueck’s “Untitled (Big Man),” a 7-foot-tall sculpture of a naked, bald man (at left below). Credit for the “Big Curator” wording goes to the writer of the Yahoo article, JE Skeets. 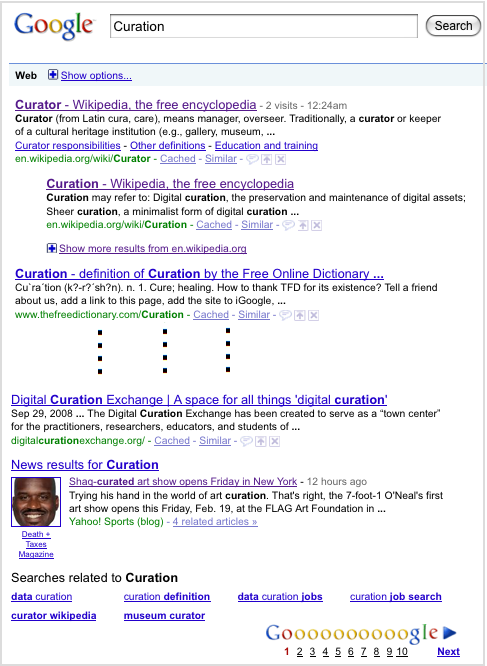 How I happened upon this little gem: At the bottom of the Google search screen below for “Curation” there’s an entry for the Shaq story, with an attention-grabbing Shaq picture, under “News results for Curation” (How often is CURATION a subject for news 😉 ) … Sure looks like another case of controlled serendipity! Posted in Curation, PicsYes, Serendipity, Uncategorized. 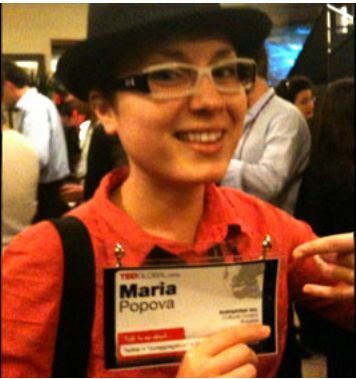 Beyond America: The *Wide World* Web – Maria Popova is apparently a native of Bulgaria (although her Twitter page says she lives in LA) — Which brings up something I’ve noticed for many years — Often some of the most creative, innovative work on the Web comes from countries other than the US. I thought about this again recently, when researching an article on Apple honchos Steve Jobs (whose biological father is Syrian) and Jonathan Ive, who’s from Britain. Leaving aside the question of why this non-US strength in quality web-work happens, I think it’s worth noting that it does. I’ve been thinking about making a tag to describe this (which I can use for several articles already), and I’m thinking about what to call the tag. Surprisingly there doesn’t seem to be a smooth, non-negative phrase for this (offshore, international, non-US don’t feel right). So I’m thinking of using the tag Wide World — Not strictly accurate, of course, since the US is part of the world, but I think it communicates the sense of the idea. I’m open to suggestions, via comment or email. Posted in Curation, PicsYes, Serendipity, TED, Uncategorized, Wide World.